When traditionally white public schools in the South became sites of massive resistance in the wake of the Supreme Court's Brown v. Board of Education decision, numerous white students exited the public system altogether, with parents choosing homeschooling or private segregationist academies. But some historically white elite private schools opted to desegregate. 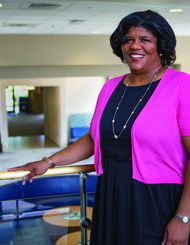 The black students that attended these schools courageously navigated institutional and interpersonal racism but ultimately emerged as upwardly mobile leaders. Transforming the Elite tells this story. 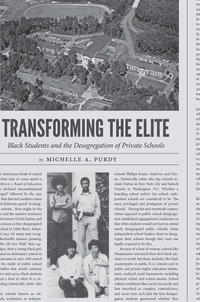 Focusing on the experiences of the first black students to desegregate Atlanta's well-known The Westminster Schools and national efforts to diversify private schools, Michelle A. Purdy combines social history with policy analysis in a dynamic narrative that expertly re-creates this overlooked history. Through gripping oral histories and rich archival research, this book showcases educational changes for black southerners during the civil rights movement including the political tensions confronted, struggles faced, and school cultures transformed during private school desegregation. This history foreshadows contemporary complexities at the heart of the black community's mixed feelings about charter schools, school choice, and education reform.